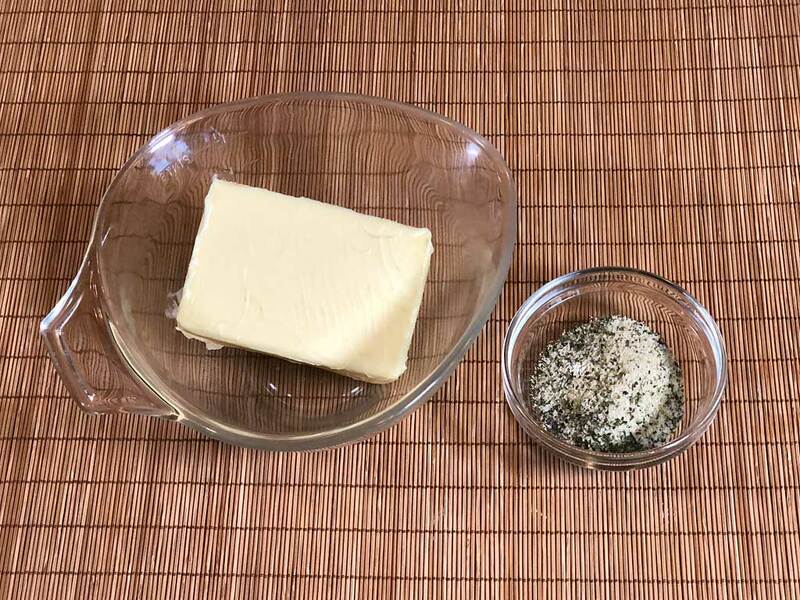 Compound butter (a mixture of butter, herbs, and spices) is an excellent way to add flavor and moisture to any grilled steak or seafood, and it’s so easy to make. 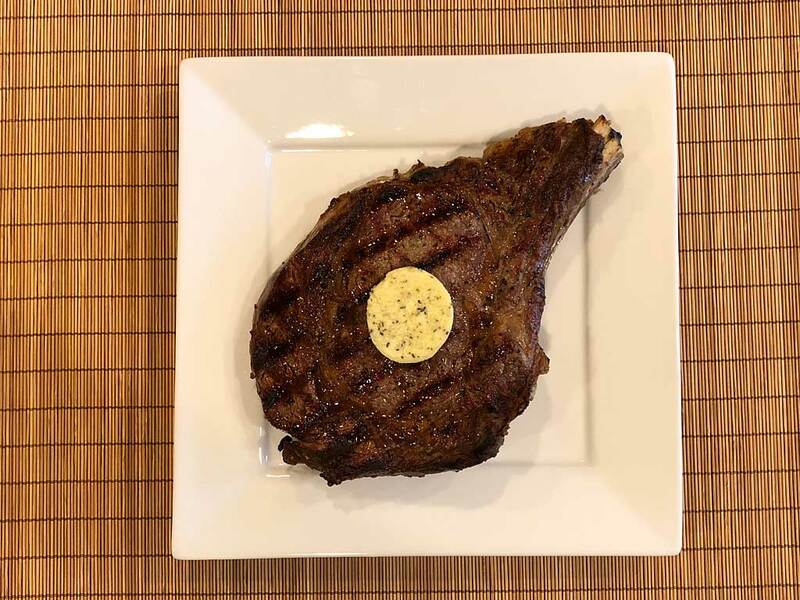 Your family and friends will be impressed at the sight of a perfectly grilled steak or piece of fish with a disc of compound butter on top, melting slowly over the meat—and the flavor will blow-away their taste buds! Herbs (minced fine) and spices (freshly ground or cracked), e.g. garlic, onion, shallots, ginger, citrus zest, peppers, etc. Acid, often lemon juice or vinegar, to balance the flavors. Sweet, rarely used, but might include honey, agave, maple, etc. Exotic ingredients, rarely used, like black truffles. Since saltiness varies between brands of butter, most compound butter recipes call for unsalted butter and add a measured amount of salt to the mixture. If a recipe does not specify the type of butter to use and salt is not listed among the ingredients, you should probably use salted butter. You can use any brand of butter you like, but if there was ever a time to splurge on “the good stuff” it’s with compound butter. By law, butter made in the United States must contain at least 80% butterfat, and most regular brands just hit that mark. 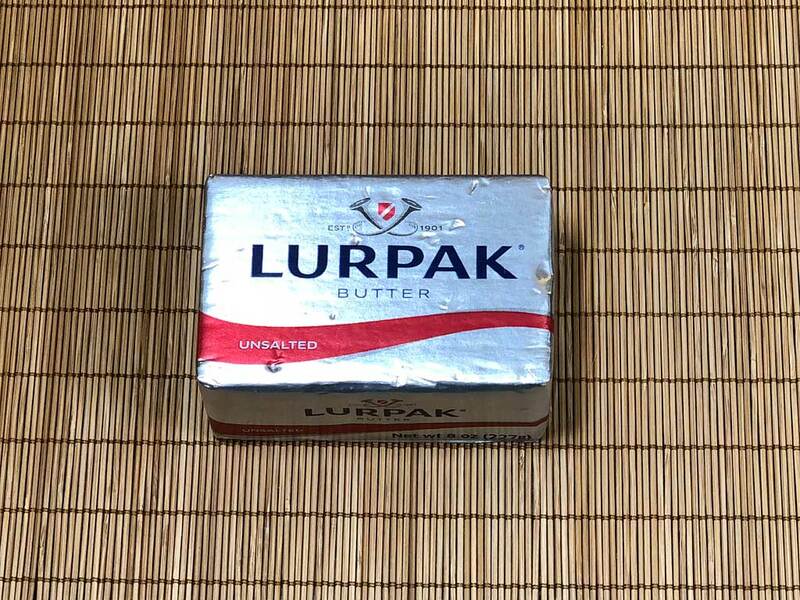 European butters like Kerrygold (Ireland), Lurpak (Danish), Président (France), and “European-style” butters made in America by Plugra, Clover, and Challenge average 82-84% butterfat. Two to four percent may not seem like a big difference in butterfat, but it’s one you can taste when the butter itself is the star of the show. Some people don’t like the tang of bacteria-added, European-style cultured butters (not to be confused with the regular European-style butters listed above), so you may want to avoid butters that include “cultured” on the label. 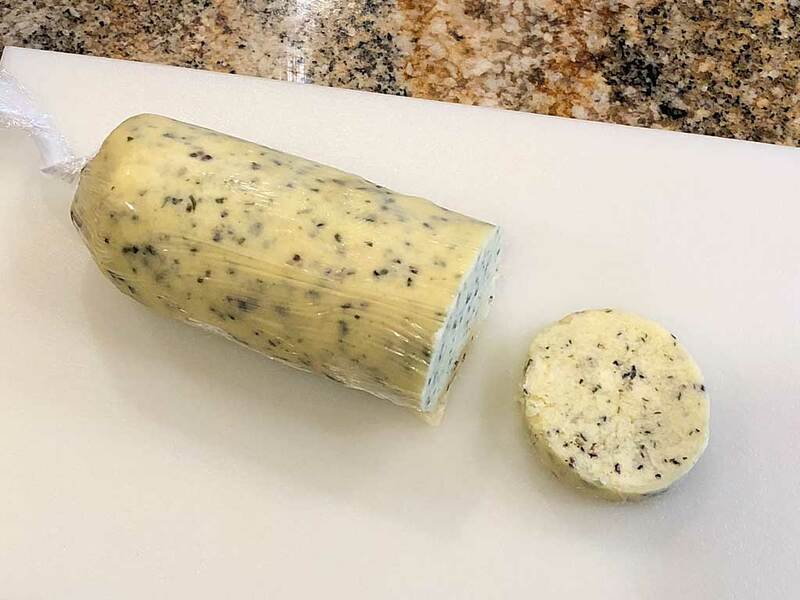 Preparing compound butter is the same for almost all recipes. You’ll find the recipe for the one shown here further down this page. Place butter and flavor ingredients into a mixing bowl. Mash and stir to combine ingredients thoroughly. Place the mixture on a sheet of plastic wrap or waxed paper and roll into a rough log. Place in refrigerator for an hour or two until the mixture firms up. 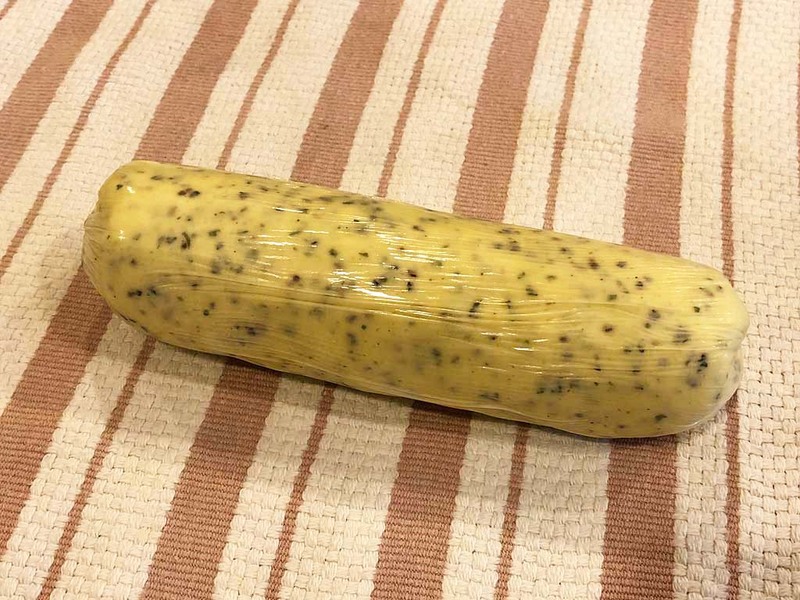 Transfer butter to a clean sheet of plastic wrap and roll into a log shape 1.5″ in diameter. 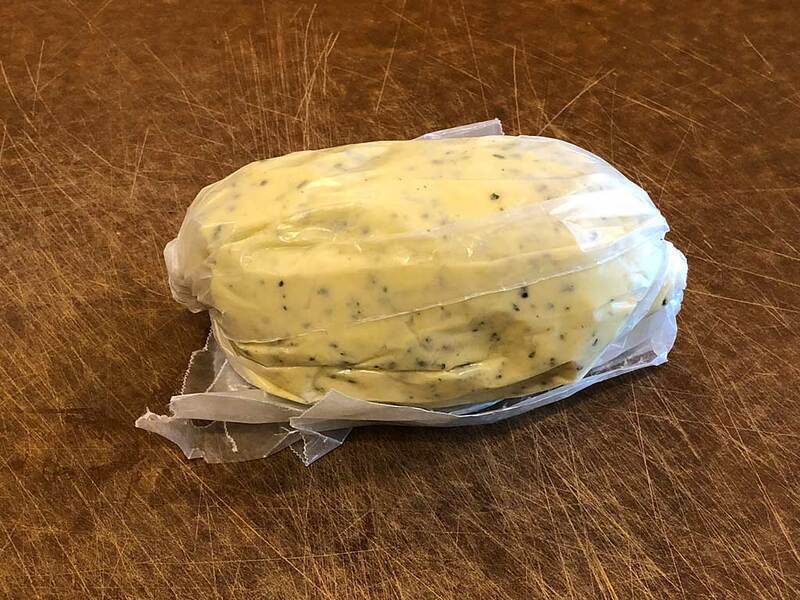 Twist the ends of the plastic tightly and return to the refrigerator, allowing the compound butter to harden completely. 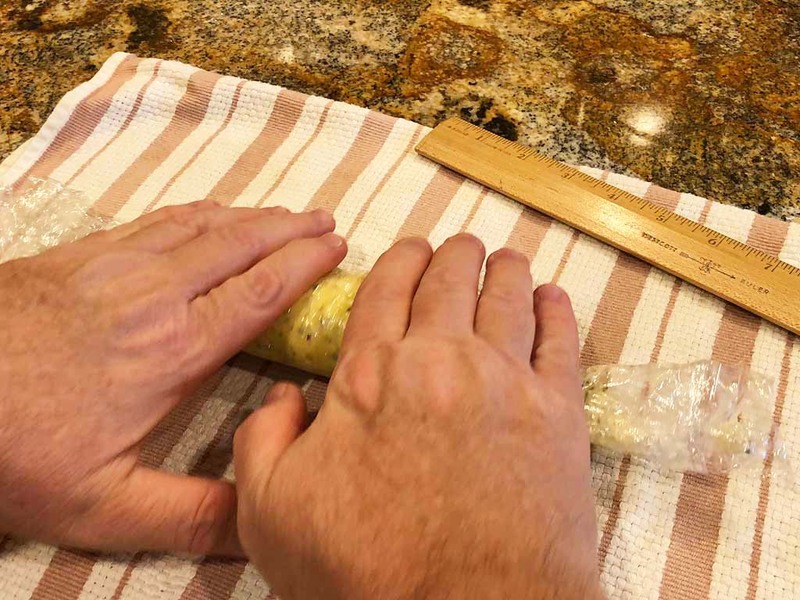 To use compound butter, cut it into discs using a sharp knife. You can cut it right in the plastic wrap. Place immediately on hot steak or fish. Compound butter should be refrigerated—and can be frozen—until needed. Here are some compound butter recipes to get you started. This is the simplest compound butter you can make, using any homemade or store-bought rub you’ve got in your pantry right now. 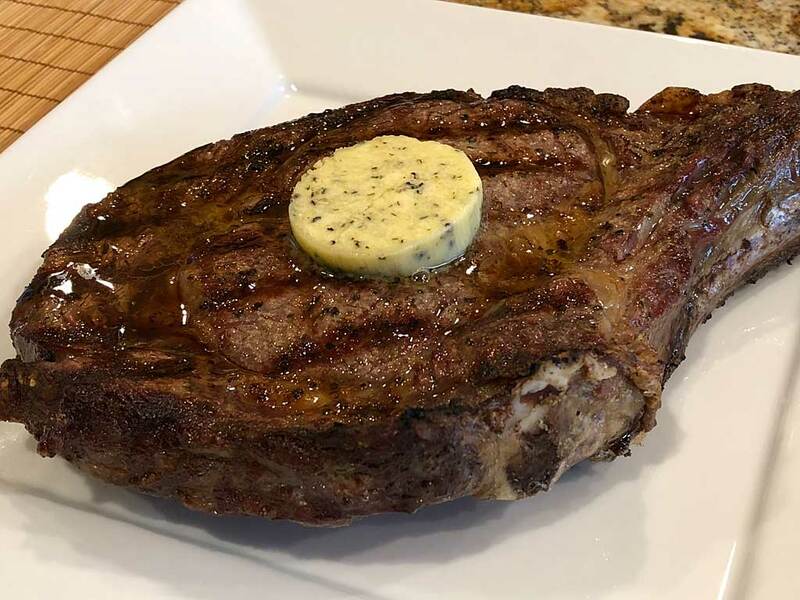 I followed this recipe to make the compound butter shown in the photos above using only Susie Q’s Brand Santa Maria style rub. You can customize this recipe by adding fresh ingredients to any dry rub, including lemon zest, fresh parsley, minced garlic, etc. 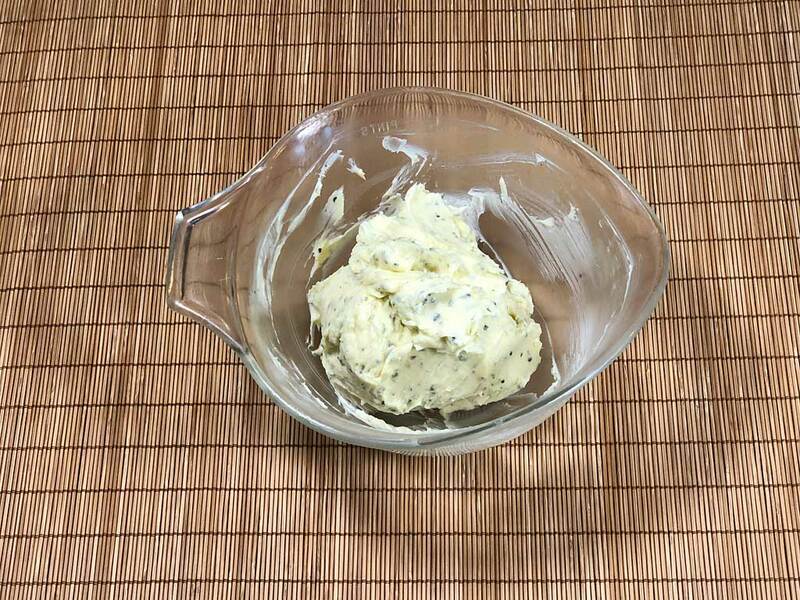 This is the classic French compound butter commonly served on beef steaks and salmon steaks. Parsley is the main herb in this simple mixture. Pulse all ingredients in food processor until nicely combined. Form into log and refrigerate before use, just like any other compound butter. Thanks to John Sp for posting this recipe to The Virtual Weber Bulletin Board for use under the skin of herbed rotisserie chicken. Kimchi is a spicy pickled cabbage that is said to be the national dish of Korea. This version of compound butter provides a Korean kick to grilled steaks and seafood. Pulse butter and kimchi in food processor until solids and liquid are combined. Form into log and refrigerate before use, just like any other compound butter. This recipes comes from Bobby Flay and takes a bit more effort to prepare. Heat olive oil in a medium skillet over medium heat. Add shallots and garlic and cook until soft, then let cool slightly. Place butter in a mixing bowl and add shallot mixture, Worcestershire, mustard, and chives and mix until combined. Season with salt and pepper to taste. Form into a log and refrigerate.